The red iris just like the name suggests is red in color and it belongs to the family of Iridacae and the genus Iris. Most irises do well when exposed to the full sun and the same applies to the red iris. Just like the Yellow Variegated iris some parts of the Red Iris are poisonous if ingested. This species blooms in midseason and it assumes the color red during the blooming period. 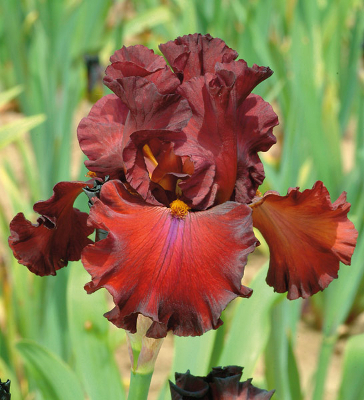 The red iris requires very moist conditions in order to survive. Also, ensure to water the plant thoroughly to avoid drying out – do not space the watering sessions so much. This plant produces a very pleasant aroma and owing to this and its aesthetic effects it is suitable for bogs and water gardens. Red is the color of love and lovers send bouquets of the red iris to communicate their feelings and affection for one another. The red iris does very well in temperate zones, and you will find the flower in areas like Asia or Eurasia. It favors dry areas, semi deserts as well as mountainous areas that are cold and rocky. This plant can also be found along riverbanks, meadows and on grassy slopes. This species is an herbaceous perennial plant and can also be invasive. In order to get the best from this flower it is wise to use a fertilizer to improve soil fertility. Compost manure is equally good for increasing organic matter. When planting the red iris always separate the rhizomes and ensure to give enough space to reduce crowding and allow enough air and sunlight. Once the red iris is well established you can easily separate the rhizomes and replant them for more flowers.